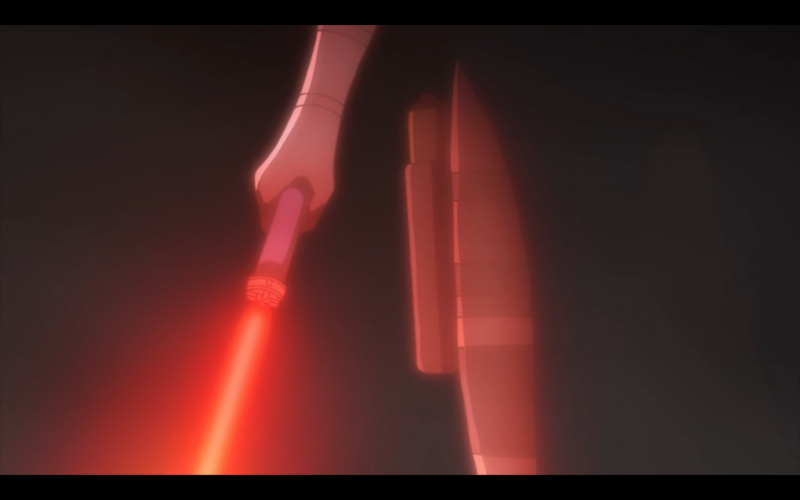 I love how Fuka throws a giant monkey wrench into the drama of this show. 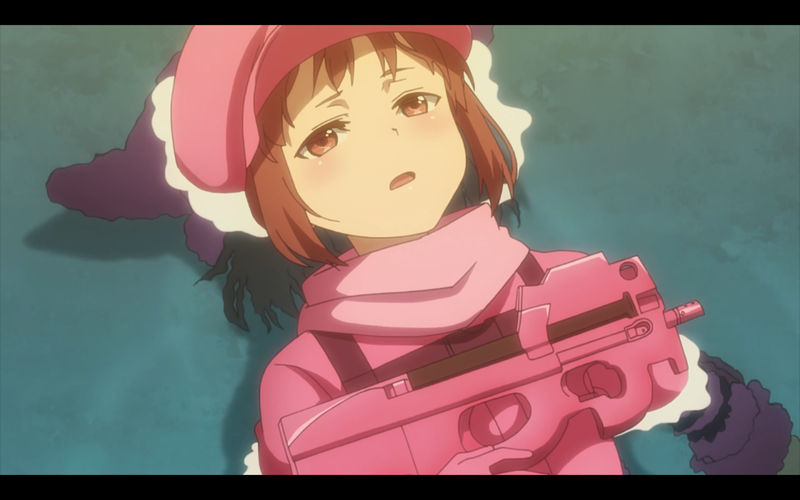 LLENN thinks that the situation with Pito and M is something she must silently bear alone, her personal burden, yet Fuka will just blab to anyone they bump into “Yeah Pito is going to kill herself after the game, lol who does that?” So against LLENN’s wishes, the world’s most rockin’ Rhythmic Gymnastics team has been pulled into Operation Don’t Let Pito Die Until We Kill Her. 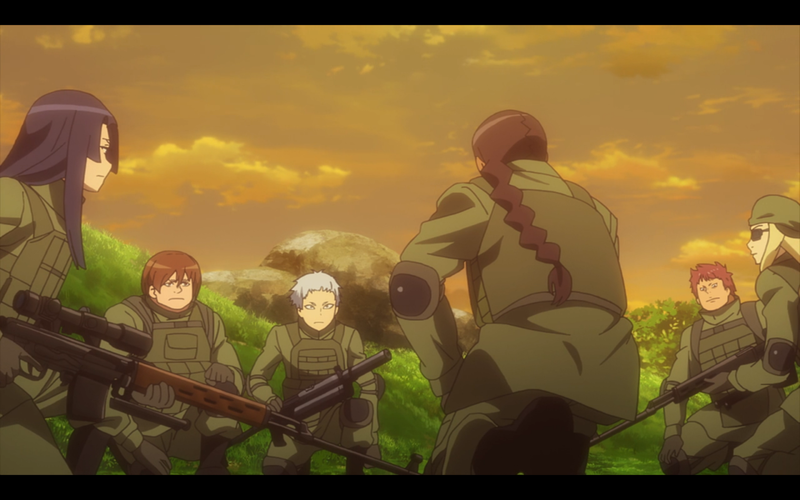 Post opening, there’s a scene where a team tries to ally with Pito’s team, she refuses, an then they agree to have a cease-fire until both teams are properly separated. Pito naturally breaks the ceasefire immediately and shoots the other team in the back, leaving just one survivor. If this is supposed to be another example of how crazy Pito is, it doesn’t really work, since I kind of agree with her here. If the other team knew enough about Pito’s reputation to want to team up with her, yet didn’t see this coming, they kind of did this to themselves. This is another time when actually playing MMOs would probably give me a different perspective on this, since I have no idea how popular and commonplace this kind of “gentleman’s agreement” is in competitive shooters. 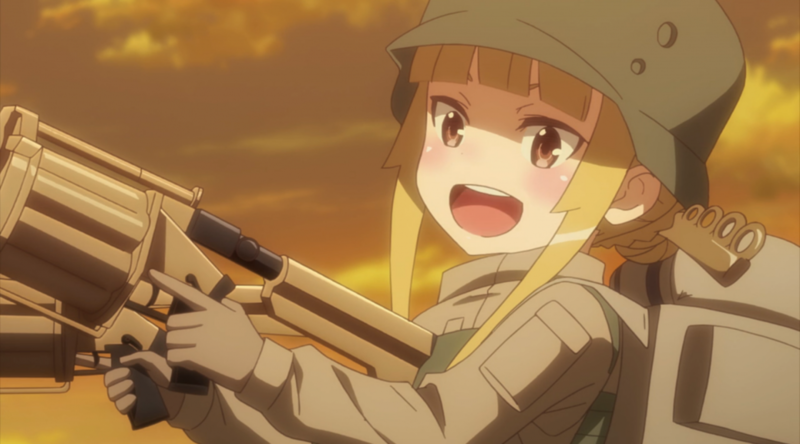 However, it’s been pretty clear from the start that GGO is a “kill or be killed” sort of culture, and once the game starts, all bets are off. Maybe that sort of “let’s all be honorable combatants” thing would work in ALO, but it seems like it’s just foolish here. Pito does let the last survivor get away, since the girl supposedly doesn’t shoot, and she’s not going to bother killing a non-combatant. It’s clear Pito does have her own brand of personal honor, for whatever it’s worth; it’s just inexplicable to everyone else. 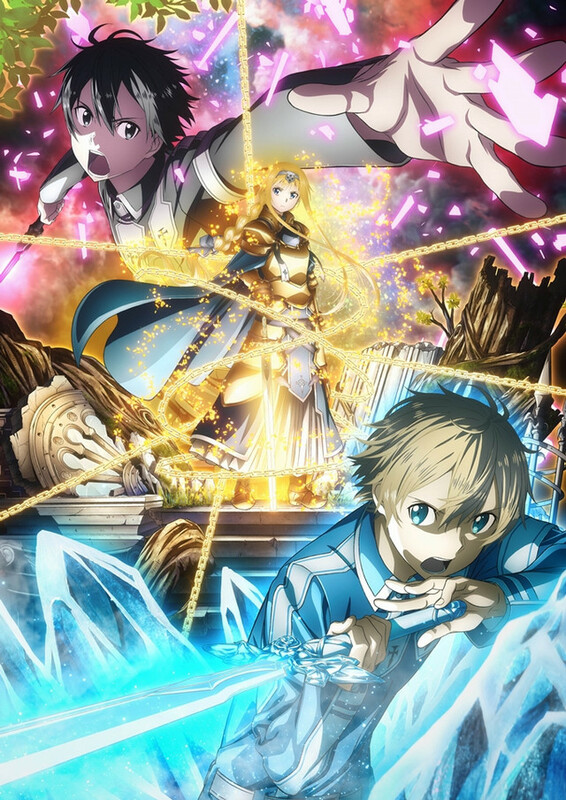 The rest of the episode primarily focuses on Team Rhythmic Gymnastics executing their plan to break M’s shield, taking away PM4’s defensive advantage, which they do. 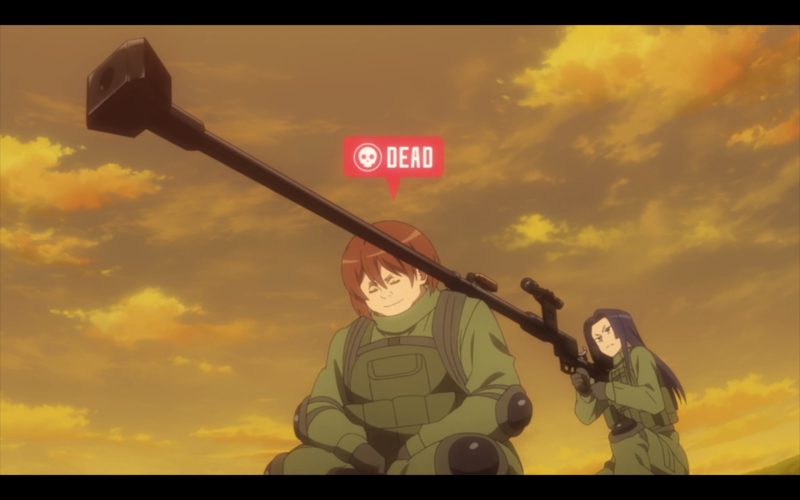 It’s a pretty neat plan too, although I wouldn’t be surprised if the rules in GGO change to stop bodies from being considered “immortal objects” for 10 minutes, because man, players are getting a LOT of mileage out of that rule. In the next patch, dead bodies will not function as immortal objects, and will instead disappear immediately, like fairy dust. 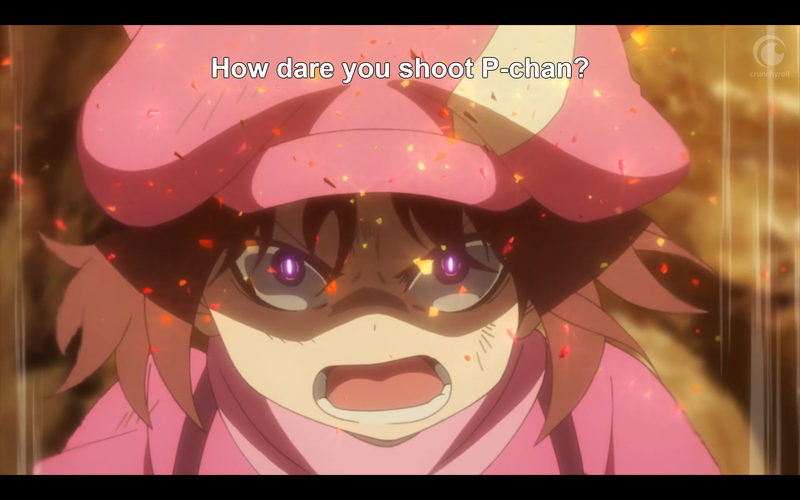 Thanks a lot, LLENN and SHINC. 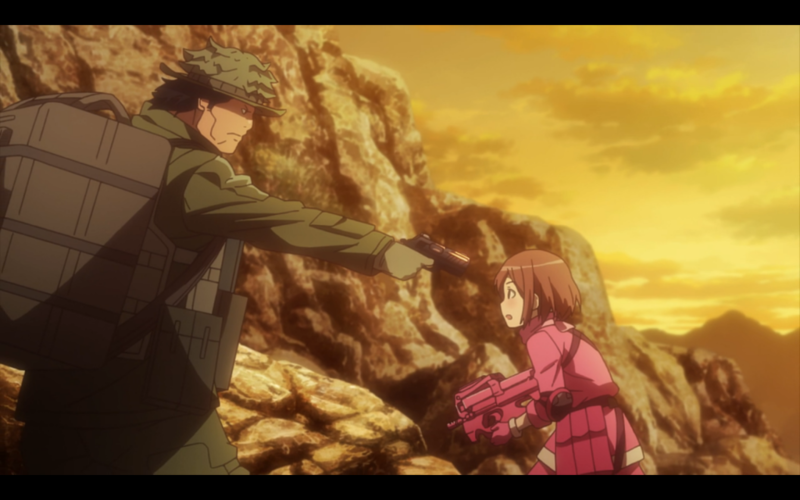 As an aside, I like the fact that the Machine Gun Lovers got taken out offscreen with no fanfare. 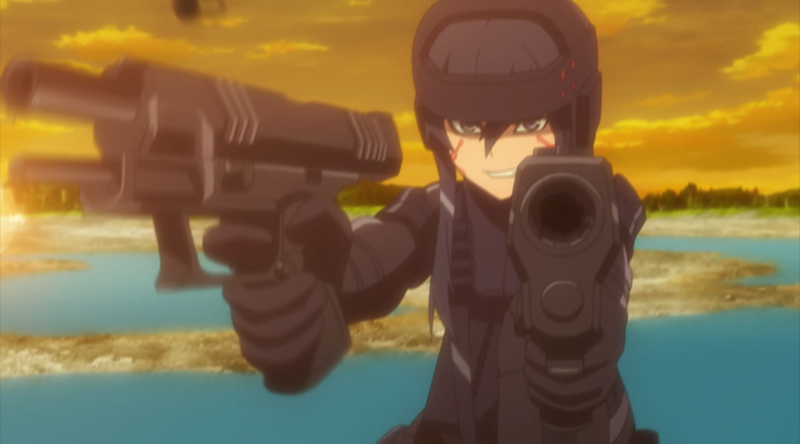 Being a gun fetishist is kind of a bad thing in GGO, because using a weapon because it’s cool probably means you don’t have a strategy beyond that. Look at Pito; I think she uses about 12 different weapons, depending on range and the terrain. 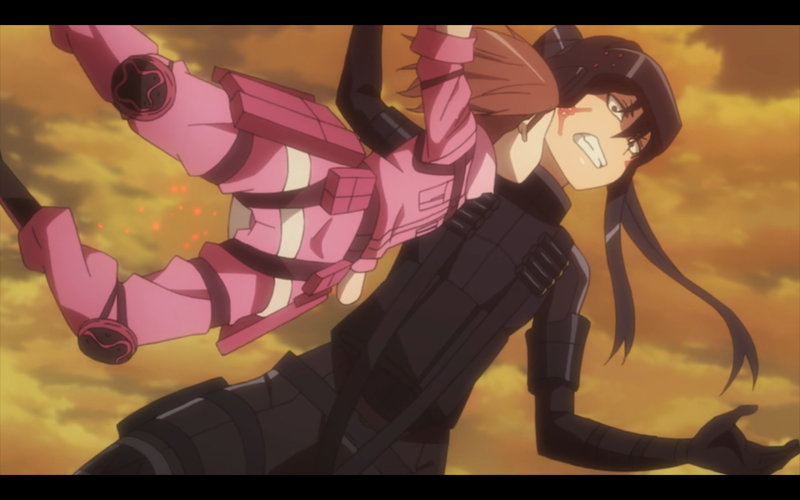 After M’s shield is broken, LLENN moves in to take out Pito, except Pito gets sniped in the head by the one girl she let escape earlier, yet survives. I’m on the fence about whether or not this annoys me; on one hand, Pito was shot in the head (through the eye no less), and she really should be dead. Then again, they are inside a video game, where missing limbs grow back after ten minutes and dead bodies become impenetrable titanium shields; real-life rules only apply intermittently. We learn that Pito must be using a Nerve Gear, which is probably better proof of how insane Pito is than anything we’ve been shown so far. 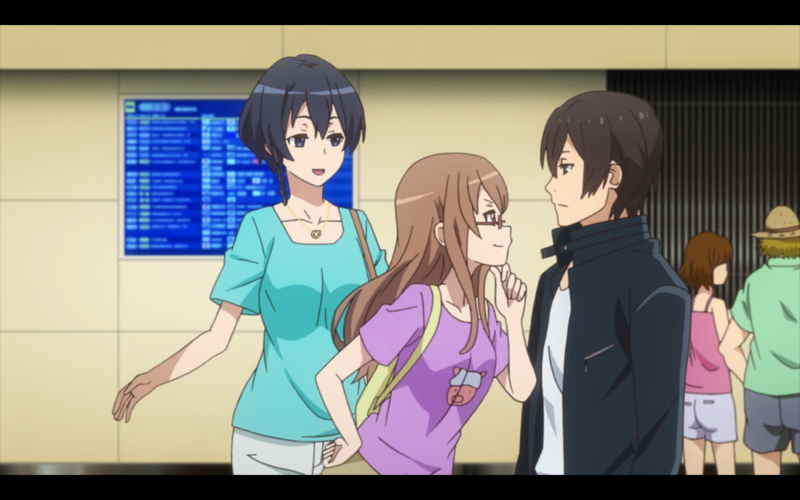 “You know all those critical safety protocols that VR games added after Sword Art Online? Yeah, I don’t want those.” While she recovers, the rest of PM4 fends off another team, but it’s all for naught; the team has infiltrated the log cabin where Pito is recovering! Oh noes, how will Pito and M ever get out of this conundrum??? 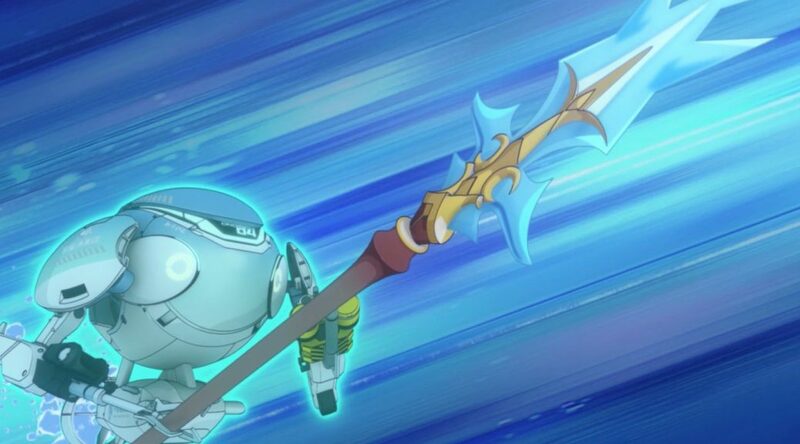 Pito picked up a version of the Photon Sword that Kirito made famous, so it’s all good. 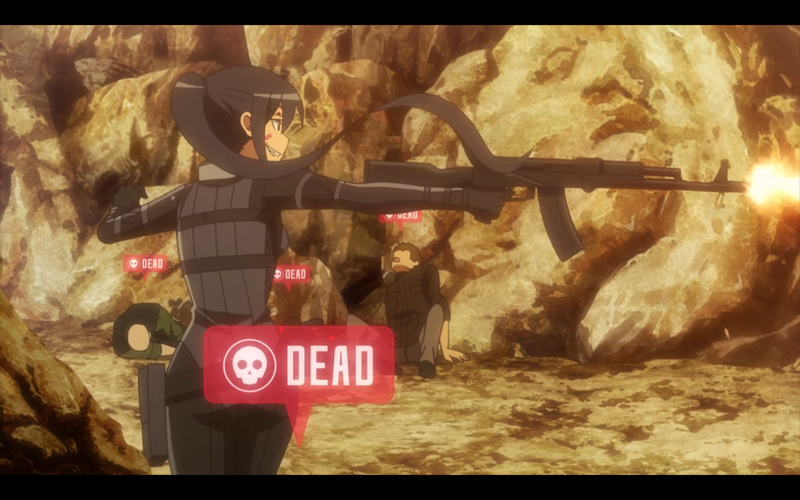 I know some people groan at the references to Kirito and Sinon on this show (especially Sinon, who’s been mentioned at least three times), but personally I like it; I like the fact that SAO S2 is acknowledged and in continuity here. The fact that players actually learned things from the last Ballet of Bullets and adopted new weapons/tactics makes the whole situation more credible. 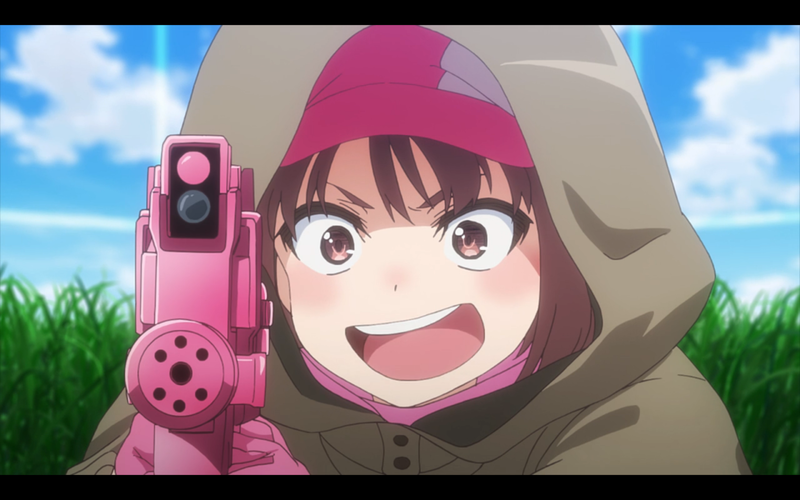 So with the rest of the opposition further whittled down, it looks like our Pito/LLENN face off is finally about to happen. 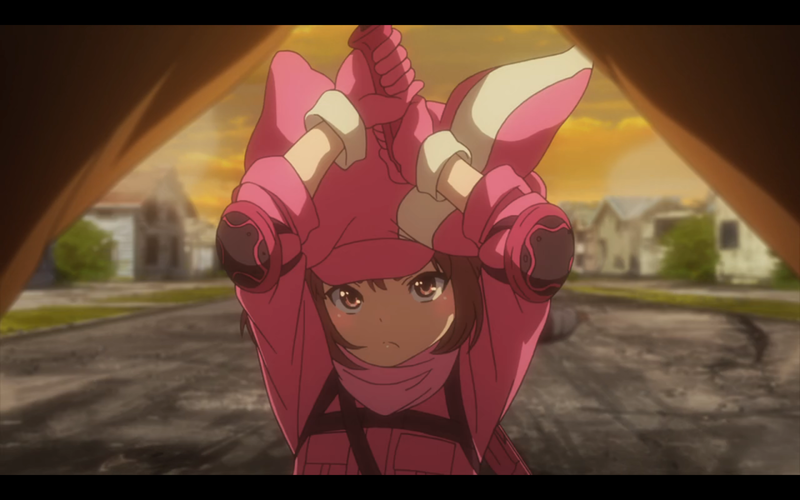 If LLENN ends up perching on the top of Pito’s photon sword and then backflips off at some point, I will do a dance in my chair. I’m not proud of that, I’m just saying that it’s going to happen. Last thing I’ll mention is how I love how LLENN and the gymnasts have decided that they’ll team up in exchange for lots of yummy sweets next time they meet. 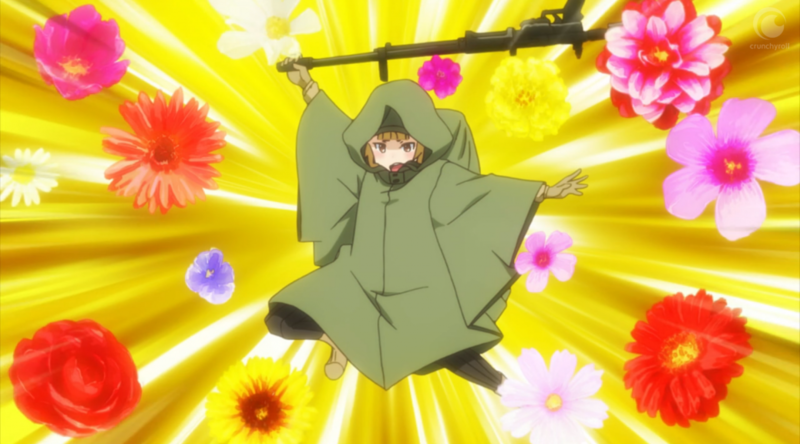 Who says that girls using submachine guns and anti-tank rifles can’t be feminine when they feel like it? 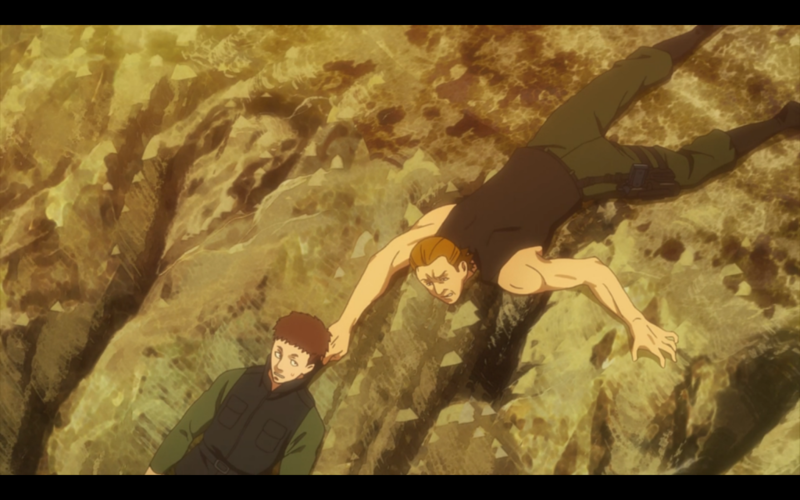 This show has done a lot to assuage my initial fears. 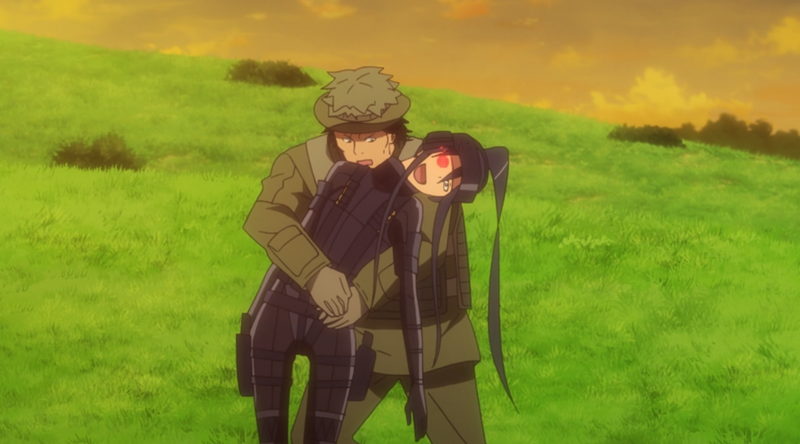 From the very start, my biggest problem with the concept was that Gun Gale Online, the game itself, just didn’t look fun to play, and after the last few episodes, I really can’t say that anymore. 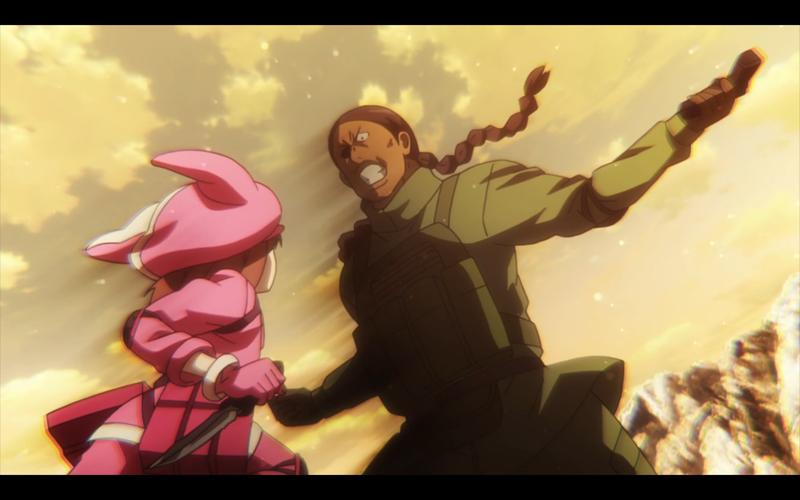 Personally I’d still prefer to be flying around as a wind fairy in ALO any day of the week, but I admit that I can see why the strategic-yet-visceral gameplay of GGO would be fun. We get the Pito-Rampage-of-Terror that we were all but promised last episode, and boy does she deliver. I get the impression that Pito is just someone who has an innate talent for violence, like Frank Castle as the Punisher. She doesn’t do any ridiculous acrobatics or make any insanely hard shots or anything, she’s just really quick and decisive and make the shots she needs to make. I hesitate to use the word “realistic” in regard to anything that happens on this show, but I think there is an element of realism to her “massacre” that makes it effective. 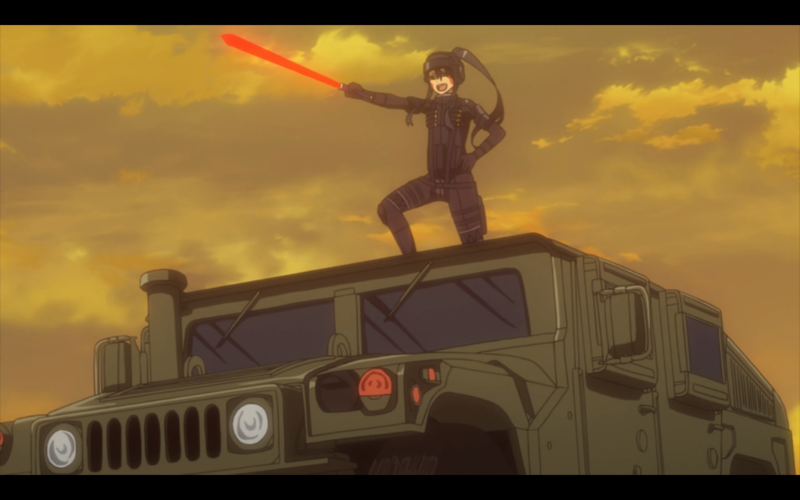 If she just could just magically shoot people with twin machine guns while doing 15 backflips in the air, it wouldn’t be nearly as effective. 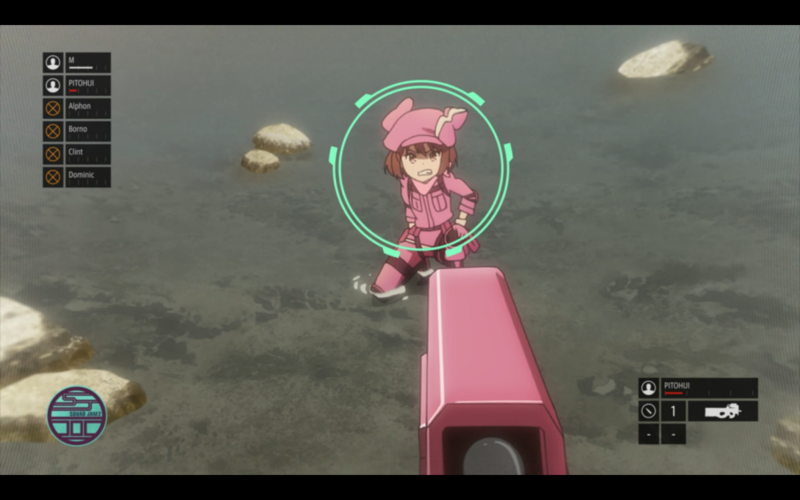 However, as deadly as Pito is, I think the “ten minute massacre” in the title also refers to LLENN taking out about 20 other players. 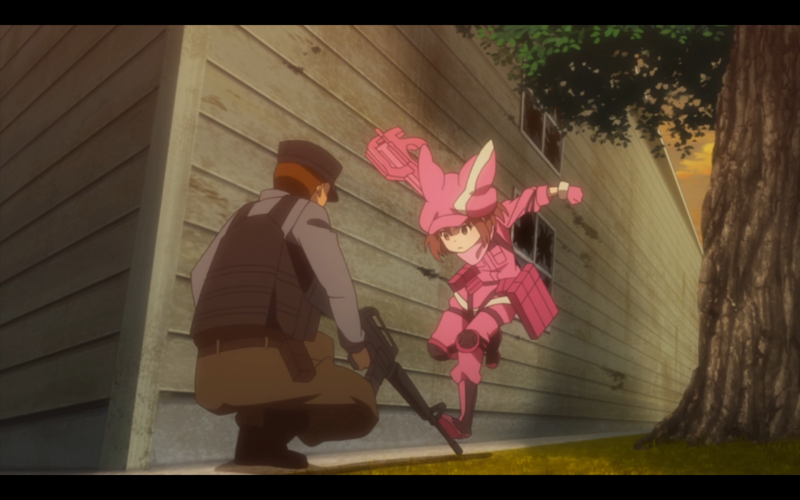 What’s interesting is that LLENN doesn’t want to fight; she wants to take the line of least resistance and slip out of sight, only to resort to fighting three other teams when she has no other choice. 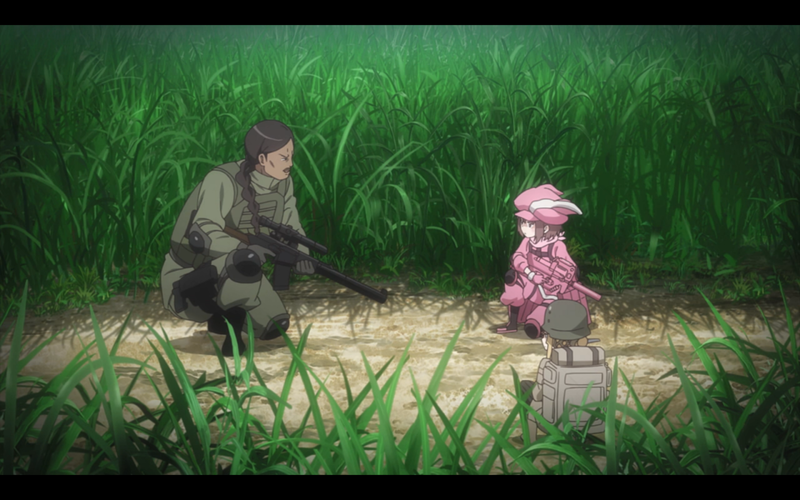 I wonder if there’s an element of LLENN lying to herself here; pretending she’s the nice gal who only fights when she has to, when in reality she’s even more dangerous in combat than Pito is, because she doesn’t waste time grandstanding. I don’t get what the deal is with these two dudes, desperately holding on for dear life when it’s clear they’ve lost the battle. 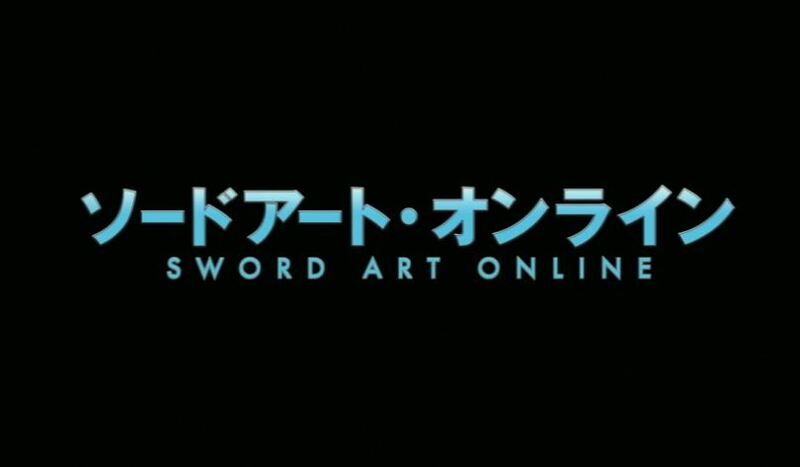 Guys, your dedication is impressive, but this isn’t not Sword Art Online; you know you can just log out of the game once you lose, right? Now I’m having flashbacks to Metal Gear Solid and Liquid Snake sneering “You ENJOY all the killing!” and argh, I did not want to think about that today. Now I have Cam Clarke’s voice in my head, and it’s probably going to stay there for about three hours. Damn you MGS and your intensely memorable voice acting! 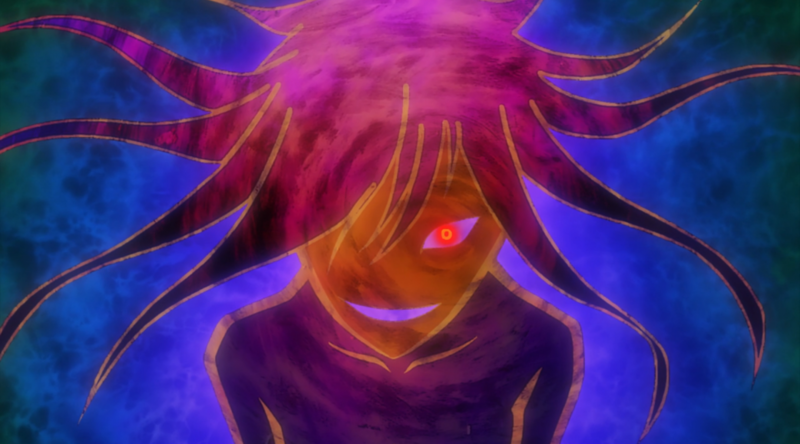 On another note, I’m beginning to wonder if Pito is really as crazy as M says. We really only have his word for it that she’s planning to kill them both, and for all we know, he could be the true crazy one. You’ll notice that for all of Pito’s ruthlessness in battle, she’s very well aware that the people she “kills” are going to be chilling out in the lobby the moment she’s done with them, and she seems to be perfectly happy about that. It’s still entirely possible that what M told us about her is true, but I’m not certain. Anyway, we then get a weird scene where a female player hits on LLENN a whole lot, and it’s kind of irritating. 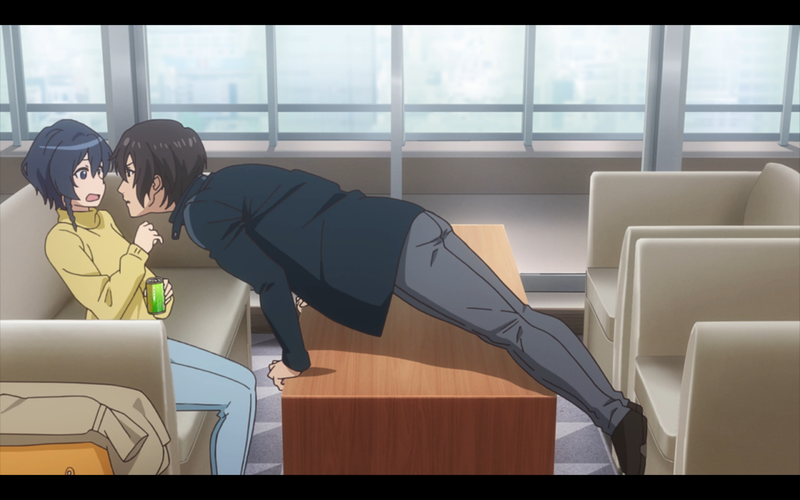 I get that it’s supposed to be humorously awkward, but it just drags on for too long. 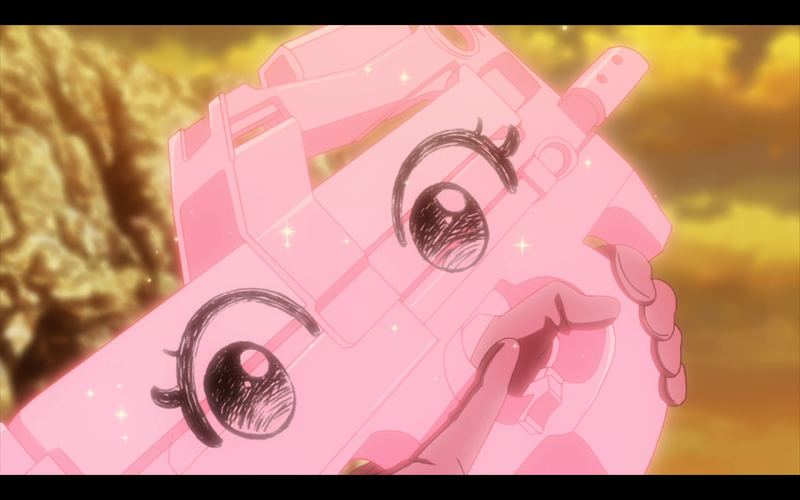 I do however enjoy how psyched LLENN got at the idea of getting more ammo; you can tell she’s become a true gamer now, the way she lusts after bullets. This is the face I make whenever I discover a cache of ammo in Tomb Raider, except I’m less maniacally adorable and more just, well…maniacal. 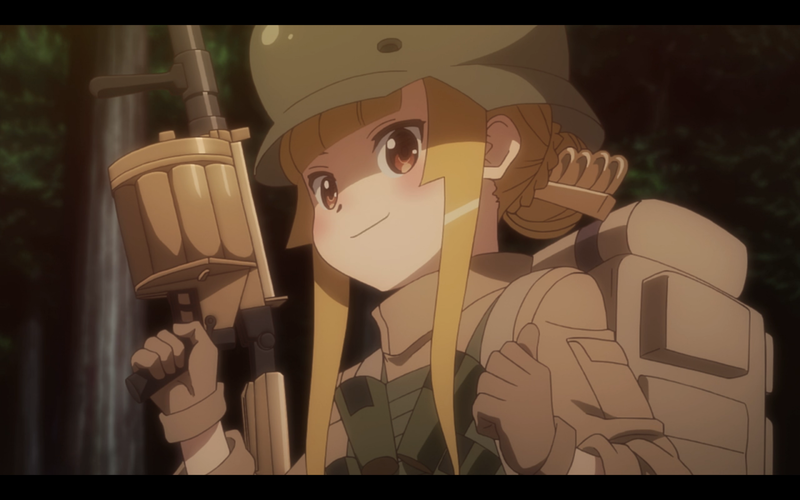 That annoying scene serves a purpose though, because it allows a skilled team to sneak up on Team Death By Loli, and then we’re at the end of the episode. 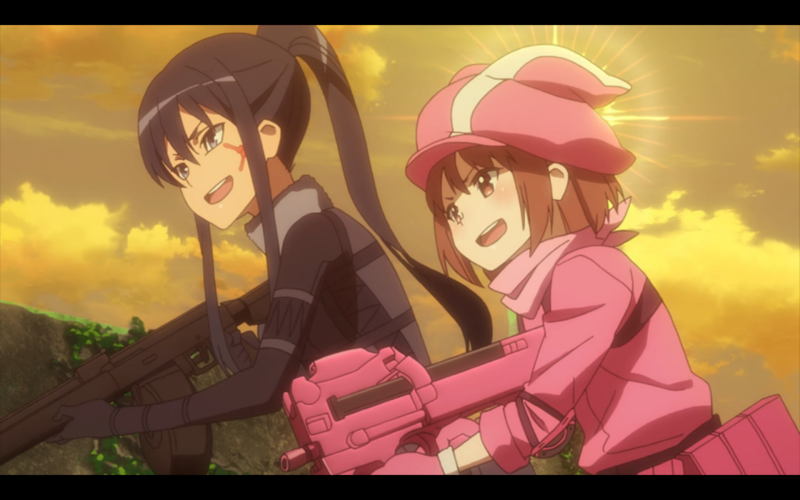 Looks like we have at least one more episode of the girls wreaking utter havok before the inevitable Pito/LLENN face off, so I hope they continue enjoying themselves. I could have sat down and guessed at potential plots for this show all day long, and I have to admit, I never would have predicted this one. I thought there would be some mysterious, shadowy conspiracy, or an evil villain trying to hack the game, but Karen drawn into the romantic nonsense of two certifiably insane people? Did not see that coming. First, let’s deal with the rhythmic gymnastics team. 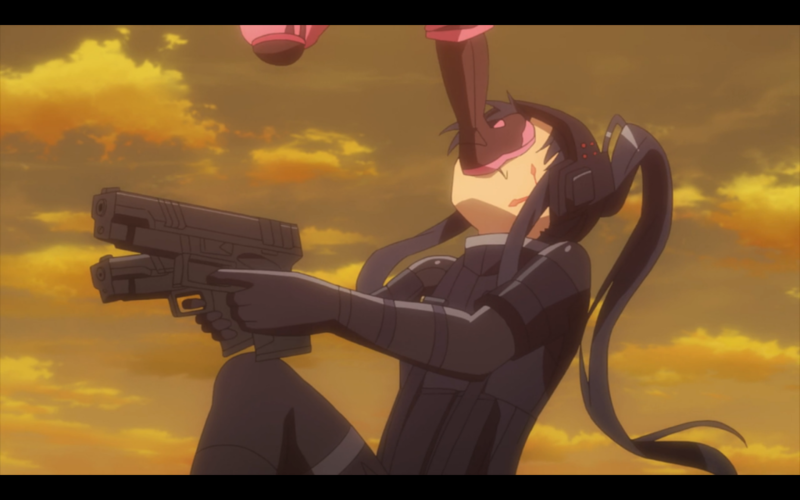 Initially I thought having the girls meet up with Karen post-Squad Jam was just a pointless bit of fluff, but as the girls explained their motivation for playing GGO, they presented a good justification for the existence of violent video games in general. 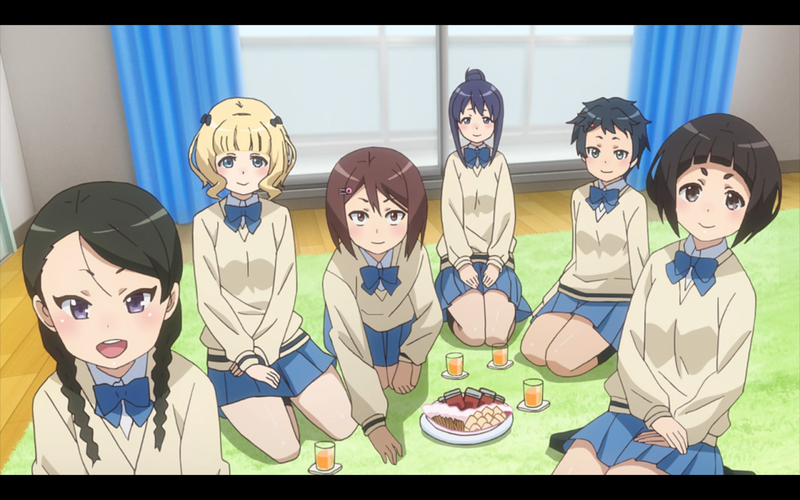 Thanks to GGO, the girls were able to become “war buddies,” without the risk or inconvenience of actual war. They’ve bonded as a team, and while they could have done that in many different ways, fighting for their virtual lives together was a very effective way to do it. However, before you think the show is declaring “Violent games are great! Video Games will solve all problems!” it becomes pretty obvious that there’s a downside; the girls don’t seem to care too much about their chosen sport anymore. They started playing to improve their teamwork, but the means became an end unto itself. I wonder how often this happens in real life; people play games in part to address specific problems, only to get so into the game that they forgot about the problem in the first place. It’s something that’s likely to only become more common as games get more immersive, so it’s an important thing to look out for. 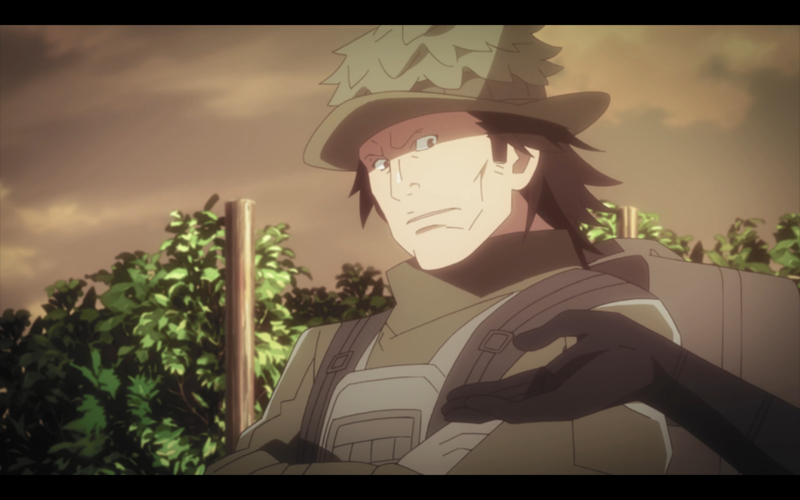 Gun Gale Online: Quite possibly the only MMO where the gamers are actually more attractive in real life than they are in the game. 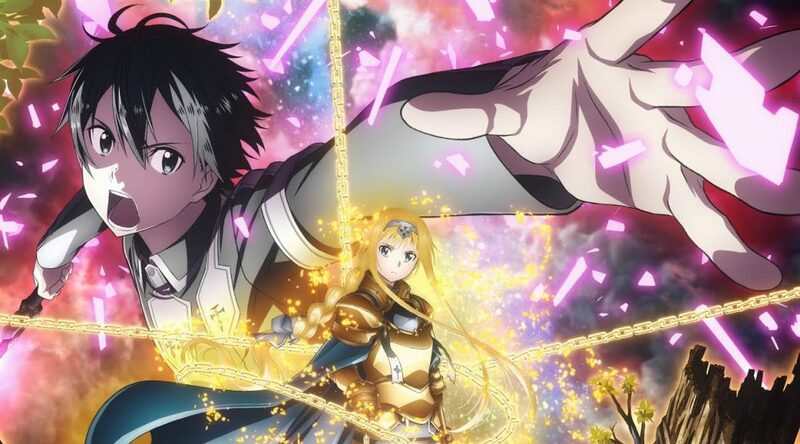 Then there’s Pito, who’s so upset that she missed out on Sword Art Online the first time around that she’s trying to put another Death Game together. Logically, thinking about the way even the most horrible things seem to become memes that people want to repeat, it makes perfect sense that someone would do this. I mean, Pito and M are clearly nuts (which Karen realizes immediately), but it’s completely believable that they would be crazy in this exact way. I hesitate to bring up school shootings, because I don’t want to get dragged into a gun control argument (and whatever merits those arguments may have, I don’t think there’s any point to having one here), but there are obvious parallels. No matter what we try to do about it, school shootings are part of the culture of the United States right now: it’s awful, frightening, sickening culture, but it’s real. 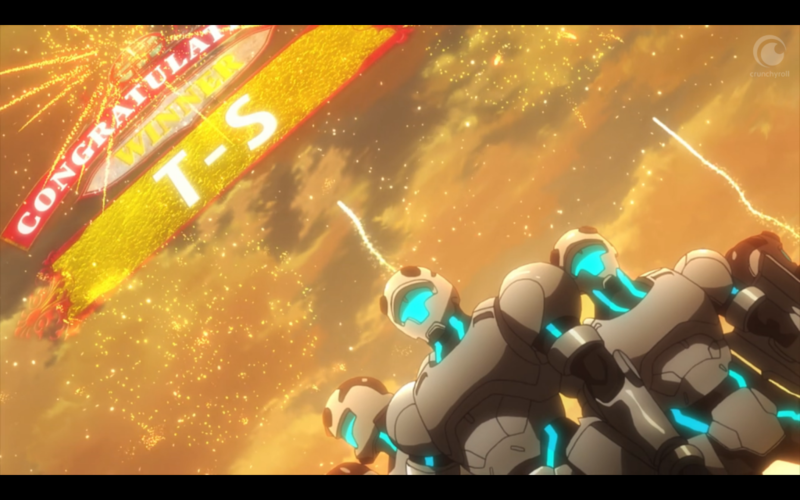 Now, in this anime’s world, killing and dying in real life based on video games is becoming the new culture. I wonder how much we have to worry about this in the future. Up until now, video games (violent and otherwise) have done little to inspire real-life violence. I’m sure there’re cases where players have hunted down other players in real life to get revenge for in-game altercations, but considering just how many people play video games, that sort of thing is still astonishingly rare. Will it remain so? Are we just waiting on a grisly, seminal event, to get it ingrained in the public consciousness to the point where it becomes a meme, and thus, infinitely repeatable? 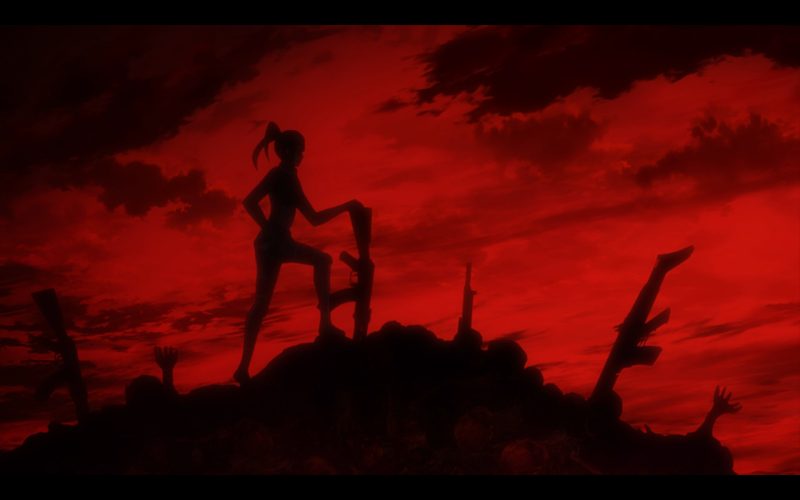 This is getting a little too dark for one of my typical anime posts, I think. 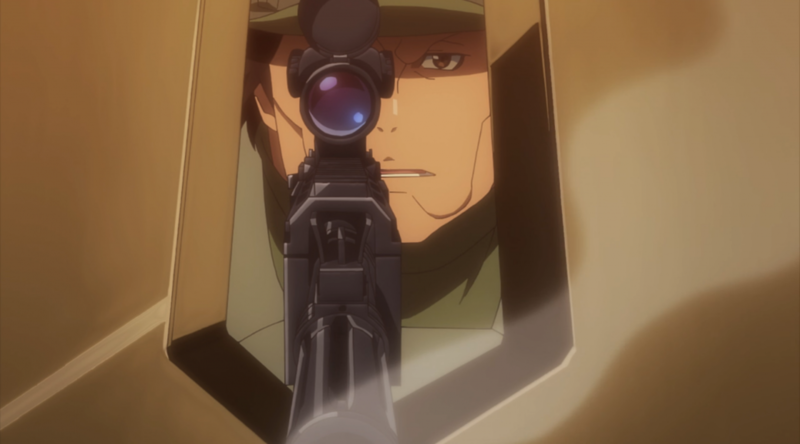 But one of the things SAO does well, just like Ghost in the Shell, is get us to anticipate societal problems that new technology may enable, before that technology exists. Maybe it’ll never exist; maybe virtual reality will remain as basically clunky and limited as it is now (unlikely, but possible I guess), and we’ll never experience the full-dive games Karen and Pito play. Maybe killing yourself in real life because you died in a game will never take off as a concept. But if games continue to become more and more immersive, this is something we’re eventually going to have to deal with. I’m impressed that this show brought this problem to my attention, but I think I probably would have been happier if I could have remained ignorant a little longer. 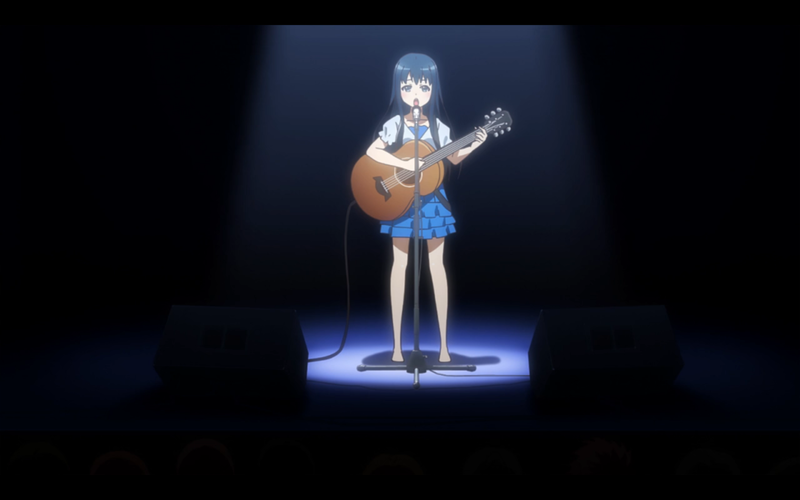 So I’m an impressed, depressed anime blogger right now. Just in case this was all too serious for you, here’s Goushi being ridiculous, because he is a crazy man with an even crazier girlfriend. Come to think of it, is Pito even his girlfriend? He could just work for her, for all we know. 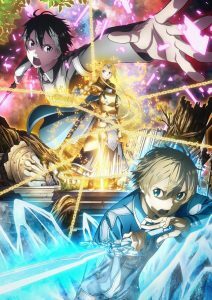 *I don’t want to say that mainline SAO never tackles these themes, because I haven’t read novels. I’m just comparing this show to the other animated entries in the franchise that we’ve had so far.